In my never-ending pursuit of products to “turn back the hands of time” on my face, I recently came across something very promising! I was reading an article about the benefits of Vitamin C that mentioned while taking Vitamin C orally is good for your health, applying it topically is great for your skin! So I immediately decided I needed to try this and looked around for a suitable product. It didn’t take long before I realized I could easily make my own Vitamin C serum and even take it to the next level adding some essential oil! How does Vitamin C help promote younger-looking skin? Vitamin C plays a starring role in the production of collagen in our bodies. Collagen gives our skin elasticity and when it breaks down, wrinkles start to form. Increasing the Vitamin C in our skin promotes collagen production and counteracts wrinkles. Vitamin C is also a great tool for combating those annoying age spots. Turns out it’s a power antioxidant that protects against and even repair UV damage, or age spots. Who knew this humble vitamin we’ve been taking for our internal health could do so much for our outward well-being as well?! Add 1 teaspoon of Vitamin C powder to a small bowl and add 1 teaspoon of very hot water. Stir until the powder is completely dissolved. It should be clear, not cloudy. Add 2 teaspoons vegetable glycerin, stir, then add 5-6 drops Rose essential oil and stir again. Rose also contains high amounts of vitamin C, and is a natural astringent that helps tighten pores and restore suppleness. Unlike alcohol-based toners, rose leaves skin feeling smooth, not dried out. Transfer to dark glass bottle, preferably with a dropper. All antioxidants, including vitamin C, will deteriorate in the presence of light and air. Apply once a day, ideally in the morning to utilize some of the sun-protecting properties. If you experience some mild dryness or flaking use a little extra moisturizer. This serum is safe to combine with all your other skin care products. If you don’t want to make your own serum but still want to try the skin benefits of Vitamin C for yourself, there are lots of topical Vitamin C products that you can purchase…from serum to lotions. Look for products that contain between 3% and 10% of vitamin C and include the active ingredient ascorbic acid or L-ascorbic acid. I have never been one for beauty products but turning 70 I thought this serum sounded good and love natural things. I have tried this 4 times. First with hot tap water, second I put in low heat micro, third time w/boiling water. After 10-15 minutes of stirring never turned clear. Thought maybe not fine enough so pulverized in bullets and tried again with no success. It never dissolved to clear. Would like to try this but what am I doing wrong. Powder was purchase at our health food store. Help me out. I am having a hard time getting the vitamin c to dissolve. Tried very hot water. Bought two different vitamin c powders. Any other ideas? It is very grainy. I put the water and vitamin C in the microwave until it dissolved, it didn’t take more than a minute. Sorry for the hassle, let me know how it goes! I’ve tried making this twice and cannot get the powder tio disolve using boiling hot water. How long does it take to disolve? Using country life vc powder. I am having a hard time getting the vitamin c to dissolve. I have used very hot water. Should it be boiling? I don’t usually reply to blogs, but I wanted to comment that heat will destroy Vit C and make it useless. So using very hot water would be in your best interest. Room temp distiller water is what I use as well as lysosomal vit c powder(Lotion Crafters). Those 2 ingredients are excellent…no need to add glycerine or anything else. If you want to use it then 1/4 tsp is adequate. I could not get the Vitamin C power to dissolve to a clear liquid. I even boiled the water and tried again. I have glycerine AND Rose water combo I got at the drugstore. Would that work as well? 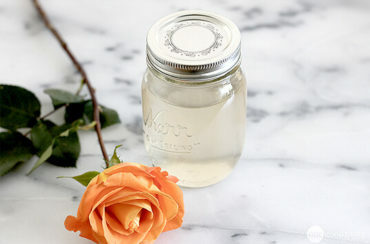 1) Can rose water be used instead of rose oil? 2) How so you like your results so far? I prefer rose oil over rose water because I like how concentrated this product is. If you wanted to make a more diluted spray or liquid, you definitely could!